In a series of social media posts, L.A. 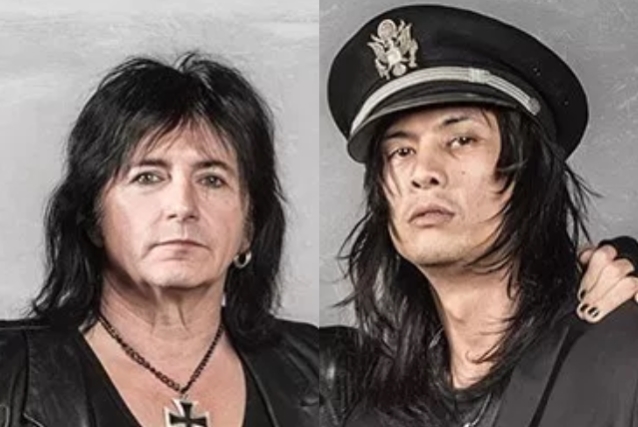 GUNS vocalist Phil Lewis explained why he pushed the group last year to fire guitarist Michael Grant, with whom he also played for several years in the Tracii Guns-less version of L.A. GUNS that disbanded at the end of 2016. Responding to a fan who questioned whether he and Guns "care what fans want," Lewis responded, "We like to play with the highest-quality musicians who step up our game. It's not a nostalgic [sic] act, believe me." When another fan specifically asked why Grant was fired, Lewis wrote, "I watched an Oprah [Winfrey] interview, and she said at this stage in her life, she only wanted to talk [with] and be around the people she chooses. I found Michael to be a narcissistic sociopath, and after countless warnings to modify his behavior, I just woke up and realized we need the kind of energy and teamwork that somebody like [current rhythm guitarist] Ace [Von] Johnson brings to the band." Lewis elaborated further on the Metal Sludge Gossip Board, where he posts under the name "Al Snug" ("L.A. Guns" backward): "[It] honestly had nothing whatsoever to do with his stagecraft. He was just insufferable to be around in close proximity. I carried him for five years, so if it was about upstaging, he wouldn't have lasted a month... He didn't like me. Didn't like the band. Didn't like the scene, but it was easy money and the chick [sic] were free so I decided to give the gig to someone who appreciates it. He's a toxic person, no doubt, and of course I knew it was gonna rock the boat. Tracii was upset, but I had to insist and knew there would be resedue [sic] but survival of the band depended on it and I have zero regrets." Grant — a former member of ENDEVERAFTER — joined the Phil Lewis/Steve Riley version of L.A. GUNS in 2013. He began playing alongside Lewis and Tracii Guns in 2016, when they initially performed as L.A. GUNS' PHIL LEWIS + TRACII GUNS before starting to tour and record in 2017 as simply L.A. GUNS. He also performed on the group's 2017 album "The Missing Peace" and the 2018 live album "Made In Milan". In the nearly two years that Grant played with Phil and Tracii, that version of L.A. GUNS managed to avoid having any lineup changes. Beginning with and including Grant's firing in March of 2018, however, the group has undergone five. Grant will not participate in the new Riley-anchored version of L.A. GUNS whicih will make its live debut at the M3 Rock Festival in Columbia, Maryland next month.